Lowdown: A young guy lacking interest in life meets an old woman who is very much alive. ABC’s At the Movies recently picked 1971’s Harold and Maude for their classic recommendations section, arousing our interest in this peculiar Vietnam War era film. Say what you will about it, interesting it certainly is. Harold (Bud Cort) is a spoiled young guy, so young he looks like a teenager to me. He lives in a mansion together with his mother, and together they form a family with obviously too much money in its hands for its own good. All Harold does is ignore his mother and fake his own suicides, while all his mother does is ignore Harold while trying to control his life and set it on a course she deems right. A course best described as old fashioned. Our Harold spends some of his spare time at funerals, where he meets another avid spectator – Maude (Ruth Gordon). Maude is the total contrast of our Harold: she is old, her life almost over by her own admission. Maude, however, is obsessed with life: nature, music, disregard for silly laws… but also disregard for values such as property ownership (in the form of stealing cars) or obeying the law. She does her mischief with good intentions and a pure heart, though, and in doing so she captivates Harold’s heart. Much more than Harold’s mother, who buys him a new Jag and arranges dates for him. 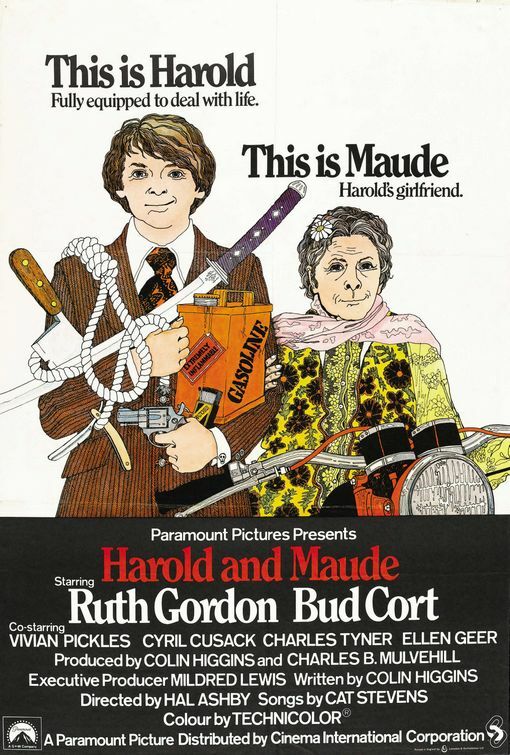 As David and Margaret pointed out in their review, Harold and Maude is clearly a product of its era. The result is more than a bit eccentric, but nicely so, even if production values are quite poor by today’s standards. Still, a film that dares to raise serious questions about life, death, suicide, authority and our approach to property is a film worth barracking for. 29/8/12: I forgot to mention the film's rather unique and very adequate soundtrack, provided by Cat Stevens. Overall: I doubt they would make a film like this today, which means Harold and Maude fully deserves its 3 out of 5 stars despite showing its age. 2/9/12: How could I forget to mention the similarities in themes and background with The Graduate? The latter is much better, though.